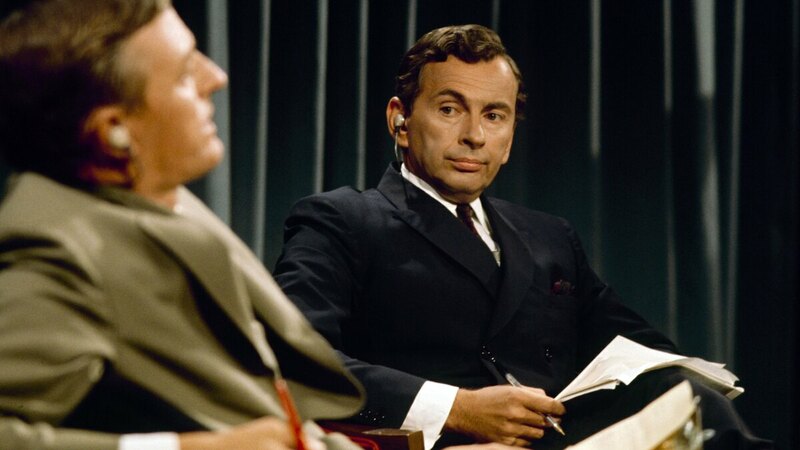 Review: 'Best Of Enemies' ABC paired two pundits from opposite ends of the political spectrum — William F. Buckley Jr. and Gore Vidal — in a series of debates. A new documentary explores the legacy of this war of words. In 1968, ABC paired two pundits from opposite ends of the political spectrum — William F. Buckley Jr. (left) and Gore Vidal — for a cut-throat intellectual faceoff. The documentary Best of Enemies explores this media milestone. Late in a series of bruising televised debates on ABC tied to the momentous Republican and Democratic Conventions of 1968, Gore Vidal beamed one of his supercilious side-eyes at William F. Buckley Jr. and called him a "crypto-fascist." Buckley bared his teeth, branded Vidal a "queer" and threatened to rearrange his face. You may be wondering why upper-crust privilege failed to inhibit a couple of brilliant intellectuals from carrying on like 8-year-olds in the schoolyard. More likely, you're unfazed because trading insults in public is commonplace these days. That, in part, is the point of Best of Enemies, an ambitious documentary that frames the faceoff between these two massively entitled egos as a milestone in the intertwined histories of television, politics and culture. When their habitual repartee — a barbed counterpoint to the politely "balanced" musings of NBC's nightly newscast, The Huntley-Brinkley Report -- tipped over into pure vitriol, filmmakers Morgan Neville and Robert Gordon argue, it set the stage for the media wars of today. That may be a reach, if only because television punditry remains pretty anodyne in the 21st century, while few, if any of today's radio shock jocks and Internet screamers can be compared to Buckley or Vidal. Genuine public intellectuals are an endangered species these days, and may indeed have become extinct with the recent death of Christopher Hitchens, who appears posthumously in the film as one of many amused and bemused witnesses to the Vidal-Buckley feud. Equal parts brash entertainment and cultural alarm bell, Best of Enemies bowls along smartly, with clips from the tapes spiced with intelligently snarky asides from friends and adversaries of the two men, and spliced with archival footage of the tumultuous times they addressed. Trailing badly in the ratings, ABC went out on a limb and paired up two pundits from opposite ends of the political spectrum, who could speak to the swelling conflicts of race, class and gender at home, and American imperialism abroad, without reducing them to pap. As living-room wars go, theirs was without parallel. On the face of it the two men were as irreconcilably different as they could be. Buckley was a devout Catholic traditionalist who founded the modern conservative movement and palled around with Ronald Reagan. Vidal was an acclaimed writer of historical novels, a liberal and a champion of sexual freedom whose satirical novel, Myra Breckinridge, was made into a magnificently terrible movie with Raquel Welch as a trans-gendered siren who visits mayhem on Hollywood. Watching the two men square off, though, it seems likely that their intense competition escalated less from their differences than from what they shared. Both came from gilded families. Both spoke in complete, gold-plated paragraphs; both were given to apocalyptic pronouncements. Today they'd be avid Tweeters, but Buckley and Vidal also shared an erudite sense of history, a breadth of vision and the sense of a common culture that's all but lost in today's single-issue wars. Each in his way was a libertarian maverick unable to fit neatly into his party of affiliation. Both had tried and failed to win public office — only to succeed brilliantly in the brashly populist medium that gave them their bully pulpit. "We gave them their money's worth tonight," whispered Vidal to a visibly shaken Buckley after eviscerating him in the war of words that brought their mutual antipathy to a head. It wasn't just a show: as every witness in the film agrees, the two men — de facto sibling rivals — genuinely loathed one another. The epic climax is fun to watch, but nothing good came of it. There was suit and countersuit, and years later, the otherwise irrepressible Buckley was reduced to silence when someone mentioned it. Was he humiliated because he lost, or because he felt he had disgraced himself? Best of Enemies doesn't try for a glib answer, but watching this enormously entertaining movie (Neville also made the wonderful back-up singer doc, 20 Feet From Stardom), I felt complicit in a spectacle, a gladiator fight that probably should never have gone public.